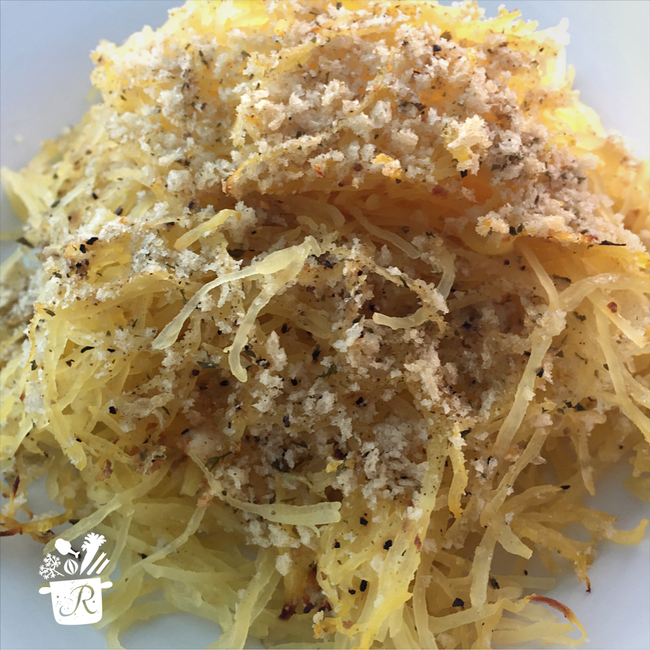 Panko Baked Spaghetti Squash is a delicious side dish and a great way to get more veggies in your diet! 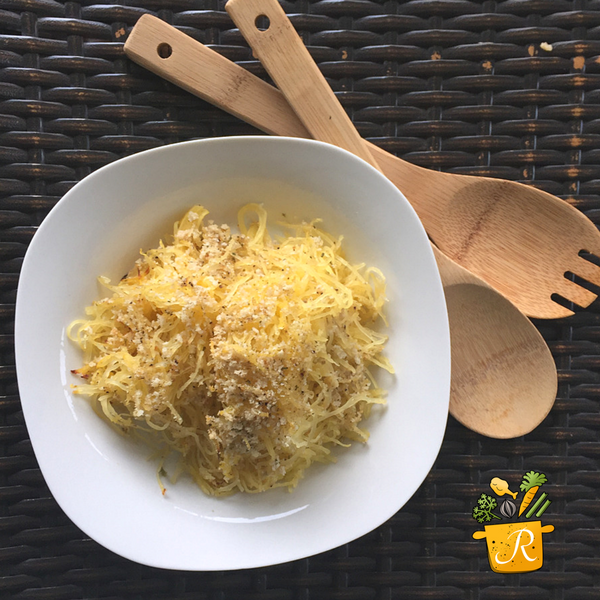 Spaghetti squash is such an underrated vegetable! It is low in carbohydrates and calories but high in nearly every other vitamin and mineral (per livestrong.com). Spaghetti squash can be served as a side dish on its own or used to replace white pasta in many recipes. It is also a great way to get more vegetables in your diet (I bet the kids will love it too!). 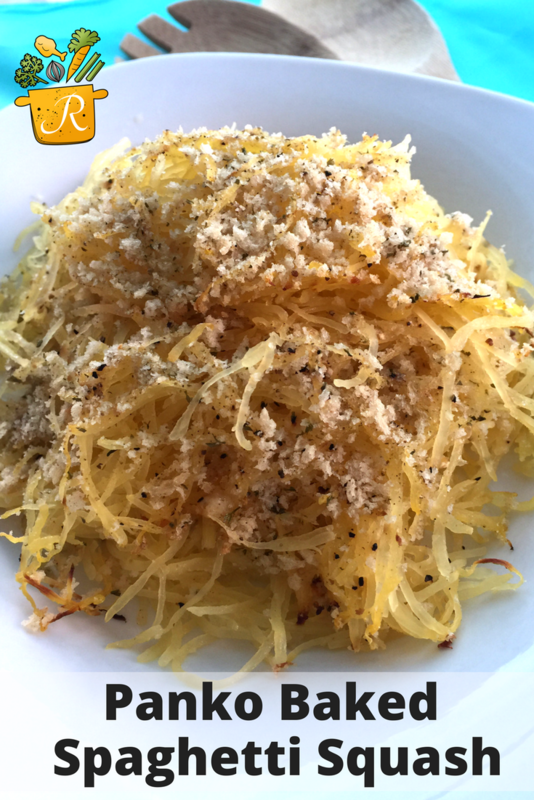 Panko Baked Spaghetti Squash is an easy side to accompany almost any main dish like Sautéed Chicken Bites or, while you have the breadcrumbs out, Panko Crusted Crunchy Pork Chops. Cut spaghetti squash in half horizontally. Use a spoon to scrape out the seeds and discard. Place the shells (cut side down) into a 9×11 baking dish and add 1 cup water. Cover with foil and bake at 375 for 30 minutes (until you can easily pierce shell with a fork). Remove from oven and allow to cool about 15 minutes. Use a fork to scrape the edges and remove the squash. (You may want to wear oven mitts because the shells can remain pretty hot). Discard shells and water from pan. Grease baking dish with non-stick cooking spray and add the spaghetti squash “noodles” to the pan. Add butter and cover with Panko breadcrumbs. Cover with foil and place in oven at 375 degrees for 15 minutes. Noodles should be hot and the breadcrumbs will just start to brown. Cooking times may vary since spaghetti squash comes in such a variety of sizes. Place the shells (cut side down) into a 9x11 baking dish and add 1 cup water. Cover with foil and bake at 375 for 30 minutes (until you can easily pierce shell with a fork). Grease baking dish with non-stick cooking spray and add the spaghetti squash "noodles" to the pan. Tara comes from a long line of Italian mothers who spent their lives in the kitchen. When she is not chasing around 3 kids or blogging, she is in the kitchen trying to live up to her legacy. Find her over as the resident Happy Mom over at Living in Happy Place.